Cbazaar offers a wide range of products and services at incredibly low prices in Australia. These Cbazaar promo codes expire soon, so don’t forget to bookmark this page now. Cbazaar free delivery offer: The most elegant collection of necklaces now comes with a discount of up to 50%. Enjoy this offer. Latest Cbazaar promo code: Special introductory offer from Cbazaar! Purchase Ethno Vogue Fusion range of sarees and grab discount of 20%. New Cbazaar discount: Get exclusive discount of extra 15% for ordering your favourite Cellars collection worth $225 AUD or more at Cbazaar. Seasonal Cbazaar deal & sale: Sign up for newsletter updates at Cbazaar and avail discount of extra 10% on your next purchase. Exclusive Cbazaar voucher codes: $97 AUD discount is offered to you for ordering ethnic edition of black art silk kurta pyjama for men at Cbazaar. Limited time Cbazaar coupon: Check out this offer at Cbazaar in which you can purchase blue art silk border saree for a sale price of $112 AUD and save 50%. Cbazaar is headquartered in the New Jersey, US and also has an office in Harrow, England. The brand's website is available to users in 130 countries worldwide – including here in Australia. The company identifies as an 'ethno fashion label', offering an inspiring blend of traditional Indian clothing and modern fashion trends. Established in 1998, they now carry over 16,000 different styles and has expanded across the world. The store caters to ladies, gentlemen and children who are searching for ethnic fashion that reflects modern times. Many products are available at discounted rates, including clothing by some of the world's most prestigious brands and designers. All of Cbazaar's garments and accessories are sold to clients across the globe. The boutique is available online only, and customers can adjust the website's settings to reflect their own country and currency as preferred. Cbazaar is organized in a way that makes clothes & accessories shopping simple for men, women and kids. Look for an outfit by occasion or by age. Inside each category, clothing is broken down into style or purpose. The accessories category also includes a wide range of jewellery items for everyday and formal wear. In the Premium style category, search by designer brand or check out the Bespoke Couture selection. The designer range is hand-picked from some of the world's finest fashion houses and brought to you online at amazing outlet prices. The website stocks a wide range of accessories and gifts for the special people in your life. Find wedding presents, style features and more in the Gifts section. This is also a great place to seek fashion inspiration, and to get ideas for outfits and looks. Many of the gift products are included in the website's sale, so you could save while you shop. Gift your loved ones personalised jewellery for the special occasion using Pictures On Gold promo codes. The site will often run a promotion for just 24 hours, with a countdown timer appearing on the screen. Social media followers and email subscribers might hear about these events early. Once the time starts, the sale is on! At the time of writing, customers had thirteen hours left to pick up 60% off everything on site – including premium fashion lines. The Cbazaar blog is filled with fashion guides and clothing ideas for every style-conscious shopper. Browse the articles and images for ideas on what to buy and how to wear it. Take a look before you shop and see the looks you could recreate for yourself. The Cbazaar brand has a sister company which specializes in tailor made fashions for any occasion. Select your style and arrange collection of your material, and the specialist seamstresses at EthnoStitch will do the rest. The outfit types can be fully customized to your preferred fit and look, and will be created just to your liking. In order to claim your discount, head over to the retailer's site and make your choices. Once your shopping is done, complete, head to the checkout and enter your code when prompted. This will apply the reduction straight away. Men, women & kids’ fashionable ethical clothing perfectly suit any occasion. Gorgeous pieces of clothing lines are very expensive but not with fashion vouchers in our clothing & accessories section. Rest assured as these discount vouchers will help save a fortune on purchasing branded & designer outfits promoted by top brands like TB Dress and Romwe. Cbazaar's YouTube channel features product and style information for customers. The clip below is one of many demonstrating the versatility and comfort of the boutique's fashions. The fine clothes sold by Cbazaar can be delivered to hundreds of destinations throughout the world. The international retailer provides reliable, safe shipping to Australia, with a small handling charge to cover tracking and postage. Any products that need to be returned should be shipped by a trusted courier. On arrival, a full refund or an exchange will be issued. 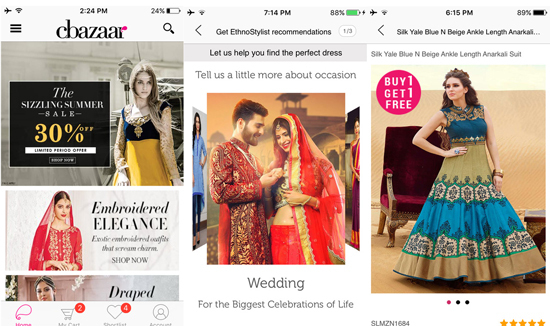 The Cbazaar mobile app can be downloaded for free from the Apple store. It works on any iOS device, and gives the user access to their account and well as the stores products and categories. Buy through the app with secure payment, and track your order as it ships. Stay in touch with the fashion boutique by following it on social media. The company rewards its followers with deals and competitions, plus a first look at clothing before it is launched. Styling advice and inspiration is also included, with Cbazaar's clothing being modeled. Keep in touch with Cbazaar by subscribing to the company's monthly newsletter. The updates are sent by email and include news about upcoming products and sales, along with special offers and discounts. Fill out your details on the website to start receiving the newsletter right away.